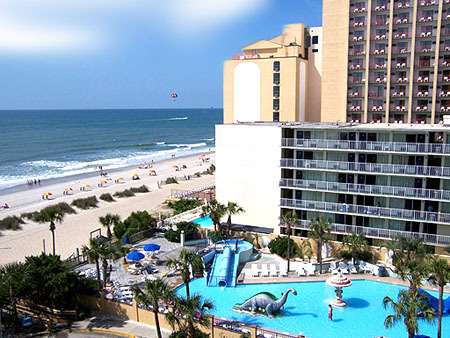 One of the most popular rental resorts in Myrtle Beach is also one of the least expensive ways to own an oceanfront vacation condo! 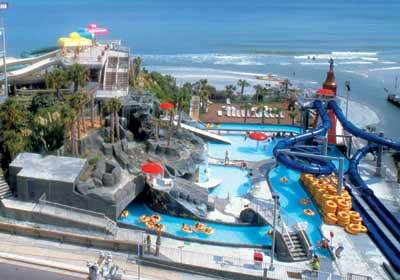 The family-oriented Coral Beach Resort is located in the south end of Myrtle Beach. All of the units are efficiencies or one bedroom suites, and most are oceanfront or at least ocean view. Kids will enjoy the resort's 10 pools, (yes, we said TEN!) several lazy rivers, a bowling alley and a snack bar. For the adults there are jacuzzis, room service, massage service, and onsite restaurants, lounges, and fitness rooms. These completely renovated oceanfront and angle oceanfront condos feature bright tropical decor. All have a private balcony, and there are 3 elevators to service guests. If you are looking for a low priced vacation condo, this is a definate must-see.